My video about Lake Biwa Museum in Kusatsu and Lake Biwa. My longest video yet at 1 hr. 6 min. I try to make my videos as short as possible, but I had to make an exception when it came to this museum and Shiga’s most prominent natural feature. But it’s a video so you can pause and resume playback at your convenience. For this video, I visited the museum three times last year. A short bus ride from JR Kusatsu Station. Open 9:30 am – 5 pm, closed Mon. and the day after a national holiday. The museum’s main attraction is the large freshwater aquarium where I focused on Lake Biwa’s endemic species. I also filmed most of the museum’s main exhibits on the lake’s history and culture. I interviewed English-speaking museum curators and attended two classes held by the museum. All in the video. Keep in mind that the video does not show everything. The museum has a lot more to see. The museum’s research wing employs about 30 researchers and scientists. I met and talked with Dr. Mark J. Grygier, Dr. Yasushi Kusuoka, and Dr. Robin J. Smith. They are specialists in micro species and small animals, something which I also wanted to show in this video. Most people know about the fish, but not the micro world. They showed me a few new species discovered in Lake Biwa such as ciliates, ostracods, and even sow bugs. They even showed me a record-breaking display of freshwater jellyfish. Lake Biwa’s fauna is very diverse, a lot more than what we can normally see. The museum also holds many educational activities for kids and adults alike. In late July 2013, I took their funazushi-making class. Funazushi is Shiga’s most famous delicacy made with nigorobuna carp (endemic to Lake Biwa) fermented with rice. We learned how to stuff the fish with rice. The people who don’t like funazushi are those who have never tried it. I love it. If you don’t have a problem eating cheese, you shouldn’t have a problem eating funazushi. 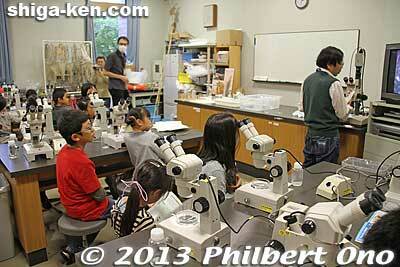 Another segment in the video is a plankton class for 18 kids held in Oct. 2013. The kids caught plankton in Lake Biwa using a plankton net and learned to identify various exotic-looking, one-eyed plankton under a microscope. Our plankton class was unique because it was conducted in English. Most of the kids were Japanese studying English. We also visited nearby Mizunomori, an aquatic botanical garden famous for 13 hectares of lotus flowers blooming in July-Aug. Beautiful flowers, but it was awfully hot and humid so we didn’t stay there for long. Lake Biwa Museum opened in Oct. 1996 and it’s operated by Shiga Prefecture. 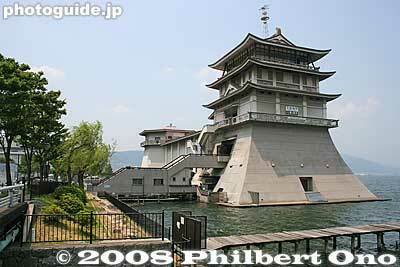 The aquarium was previously housed in the old, castle-shaped Biwako Bunkakan in Otsu. Biwako Bunkakan (Lake Biwa Culture Hall) opened in 1961 as Shiga’s first public museum that included art, history, and archaeological exhibits. The old aquarium’s 3,917 living specimens of 155 species were all moved to the new aquarium in March 1996. All the aquarium curators also moved to the new museum. The new and much larger aquarium added more species and started off with 32,413 specimens of 244 species. I remember the old aquarium to be a very cramped place with many small tanks like in a large pet shop. The largest fish tank held only 1 ton of water. One big difference between the old and new aquarium was that the old one displayed fish according to species and the new one mainly exhibits fish according to habitat such as reed beds, shorelines, rocky environments, and rivers. The Biwako Bunkakan was a landmark building in Otsu before other buildings sprang up. It evolved into a Buddhist art museum until it closed at the end of March 2008. Lake Biwa Museum sure looks like it was planned and designed during the 1980s bubble era, complete with a roof shaped like a boat hull. It’s a very spacious, beautiful building and a few exhibits or spaces are quite extravagant for a public museum. It must cost a bundle for air conditioning and fish food alone. But it’s for the sake of public education and research. Kids and families love it too. I would say it’s money well spent for a most worthy institution. After you watch this video, I’m sure you’ll agree. I thank the museum and curators for their cooperation for this video. And all the kids and their parents who appeared in the video. I really learned a lot from making this video and as always, want to share what I learned. Biwako Bunkakan museum in Otsu, now closed.